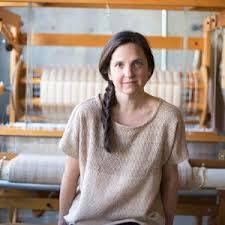 Our speaker for tonight, Adele Stafford, is a textile designer who specializes in weaving cloth from cotton that is grown and spun in the United States. She is also quite a writer, you’ll discover when you look at her really beautiful website at http://www.voicesofindustry.com. Voices of Industry is the name of her studio and shop in Oakland where she lives. She is weaving on an Ahrens Violette mechanical dobby loom which you can see behind her in the picture below. Our meeting site at Woodside Community Church parish hall is opened at 7:00 pm of setup and conversation. The program, which runs 7:30-8:30, is followed by refreshments and a short business meeting. If you’d like to come to dinner at Buck’s Restaurant in Woodside Shopping Center, reservations will be made for 5:30 pm. Hope to see you there!